LESBOS, Greece (AP) — Pope Francis is known for his symbolic gestures, but even by Franciscan standards, his visit to a Greek refugee detention center as the European Union implements a controversial deportation plan is as provocative as any he has undertaken. Francis and the spiritual leader of the world’s Orthodox Christians will spend nearly an hour Saturday greeting some 250 refugees stuck on the Greek island of Lesbos. They will lunch with eight of them to hear their stories of fleeing war, conflict and poverty and hopes for a better life in Europe. And they will toss floral wreathes into the sea to pray for those who never made it. It’s a gesture Francis first made when he visited the Italian island of Lampedusa in the summer of 2013, his first trip outside Rome as pope, after a dozen migrants died trying to reach the southern tip of Europe. He made a similar gesture more recently at the U.S.-Mexican border, laying a bouquet of flowers next to a large crucifix at the Ciudad Juarez border crossing in memory of migrants who died trying to reach the U.S. The Vatican insists Saturday’s visit is purely humanitarian and religious in nature, not political or a “direct” criticism of the EU plan. The Vatican official in charge of migrants, Cardinal Antonio Maria Veglio, was even more explicit, saying the EU-Turkey plan essentially treats migrants as merchandise that can be traded back and forth and doesn’t recognize their inherent dignity as human beings. 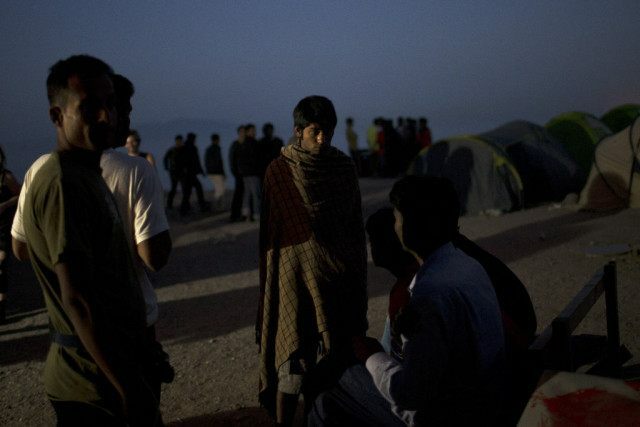 The March 18 EU-Turkey deal stipulates that anyone arriving clandestinely on Greek islands on or after March 20 will be returned to Turkey unless they successfully apply for asylum in Greece. For every Syrian sent back, the EU will take another Syrian directly from Turkey for resettlement in Europe. In return, Turkey was granted concessions including billions of euros to deal with the more than 2.7 million Syrian refugees living there, and a speeding up of its stalled accession talks with the EU. Human rights groups have denounced the deal as an abdication of Europe’s obligations to grant protection to asylum-seekers. The son of Italian immigrants to Argentina, Francis has made the plight of refugees, the poor and downtrodden the focus of his ministry as pope, denouncing the “globalization of indifference” that the world shows the less fortunate. Aside from the inherently political nature of the trip, it also has a significant religious dimension. Francis will be visiting alongside the spiritual leader of the world’s 300 million Orthodox Christians, Ecumenical Patriarch Bartholomew, and the head of the Orthodox Church of Greece, Athens Archbishop Ieronymos II. Lombardi said the ecumenical significance of such a meeting was “obvious” — and he credited Greece’s politicians with their willingness to let the religious leaders take center stage as an “appreciated” gesture of discretion.